Ján Granec (born in 1951, Šenkvice) has been a gifted person since his childhood. He did drawing and painting at the art school for children in the town of Modra. He decided for ceramics by accident – he went on a school trip to the Slovak folk majolica plant in Modra. He liked what ceramists were doing in the workshops. When he finished elementary school in 1965, he learnt the profession of ceramicist in the majolica company. A potter´s wheel has become his favourite tool. 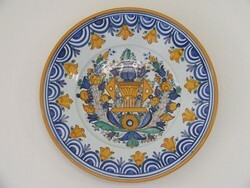 When he had completed the apprenticeship, he became a master of training in the Slovak folk majolica plant. Becoming a self-employed ceramist, he started the collaboration with the ÚĽUV in 1976. The ÚĽUV accepted his designs inspired by traditional ceramics of the western Slovakia. Later, an ÚĽUV visual artist designed new shapes for him, such as pot pockets and wine sets. Ján Granec moved to Pezinok where settled down and improved his workshop. He established a private workshop, employed people and opened a small shop in the early 1990s. Ján Granec has made a variety of products such as painted jugs, plates, cups, pots or flower pots. Now, he dreams about making stoneware products. He was awarded the title master of folk art production in 2011 for his contribution to the preservation and improvement of traditional faience and clay production.